I didn’t manage to get good photos of the elMundo I rode, so here’s a nice-looking Mundo. Imagine a battery behind the tube holding up the seat and you’re mostly there. I have said before that Yuba is the Ikea of bicycle manufacturers. This sometimes gets taken as a slur against Yuba, but I intend no disrespect. Ikea meets a market demand that no one previously realized was there: at certain points in their lives, people want cheap furniture that looks decent. Yuba realized there was a market demand that no other manufacturer was meeting directly: inexperienced riders wanted inexpensive bikes that could carry a bunch of stuff. Xtracycle pioneered that market with the FreeRadical longtail extension, but there are some limitations to their model. The first is that the FreeRadical will fishtail and flex under weight (that means you feel like the bike will fall apart while riding it loaded, even if it won’t—although with sufficient weight, in difficult conditions, it actually might). The second is that installing it onto an existing bike frame, or for that matter even understanding how it works, requires a certain baseline level of comfort with bicycles. Xtracycle attempted to address the second problem with the release of the Radish, but as the Radish is simply a FreeRadical attached to a bike frame, there are still problems with flex. They addressed the problems with flex by partnering with Surly to create the Big Dummy, which uses a solid frame, but that bike is substantially more expensive, and offers some complicated choices. Having talked to a lot of inexperienced riders, I can attest that although the Xtracycle line of products is incredible (seriously, it’s awesome), it can seem very confusing. Enter the Mundo. Yuba keeps it simple. (I rode a Mundo for a couple of weeks earlier this year and reviewed it here.) For $1200 you get a bike with a strong frame that can carry massive amounts of weight, mountain bike gears to climb hills, fenders for foul weather, and a lot of cargo and kid-carrying options (these cost extra). Hitting that price point means that Yuba has made certain compromises: there is no free lunch in the world of cargo bikes. For one thing, the bike is heavy, and even with a lot of gears, getting up steep hills involves major-league suffering. Thus Yuba created the elMundo, the electric-assist version of the Mundo. I found riding the elMundo fascinating. If you’ve read my review of the Mundo, most of the reasons the Mundo wasn’t the right bike for us are still an issue with the electric assist version. The elMundo is not our future bike. However our situation is somewhat unusual, and after riding the elMundo I think that unless there is a sea change in what other manufacturers are doing, it will soon dominate the family/cargo bike market. That is in large part because Yuba has created a bike that is simple enough, cheap enough, and capable enough that it is drawing in people who had previously never imagined that they might commute by bike with their kids. There aren’t a lot of choices to make with the Yuba line, and that can be a good thing. Longtails ride a lot like normal bikes. The learning curve is minimal. I’ve gotten comments that I harped excessively on getting used to a bike in my reviews of front box bikes, but I think it’s important for people to have a sense of how long that might take, or they will rule certain bikes out the first time they get on them. (There are multiple attempted reviews of the Bullitt, for example, that essentially say: “Yuck, I couldn’t ride it.”) The elMundo is no exception to the general “easy to ride” rule; although of course it gets tougher with the kids on deck because they squirm and that can mess with balance. Both the Mundo and elMundo can carry major amounts of weight without the bike feeling unstable or fishtailing. Yuba claims that you can carry over 400 pounds of cargo on the rear deck. A very nice (although somewhat out of date) summary of cargo bikes from JoeBike notes that cargo bikes can usually safely carry rather less weight than their manufacturers suggest, and other bike shop owners have told me the same thing. However the Mundo line is still rated to carry twice what other longtail bikes can. Unbeatable price! The elMundo lists for $2600, basically the price of a Mundo with the assist thrown in at what must be very near manufacturer cost. There is no other electric assist cargo bike I have heard of that approaches this figure. For example, the hopefully-soon-to-be-released Xtracycle Edgerunner, which looks to be a very nice assisted longtail, is supposed to list for $3500. That’s a good price for an assisted cargo bike too, but it’s still almost $1,000 more than the elMundo. Novice riders in particular are extremely price-sensitive. The elMundo, like the Mundo, has good acoustics. This sounds like a weird thing to say, but having the kids behind you instead of front means that you can’t see what they’re doing. Being able to hear them reasonably well as a rider helps smooth the ride (kids, left unobserved together, will eventually fight). Plus it’s entertaining. You as the rider still can’t be heard by them, but it’s better than nothing. The elMundo has a good kickstand, which now comes standard (the older versions of the Mundo had the better kickstand as a more expensive option). 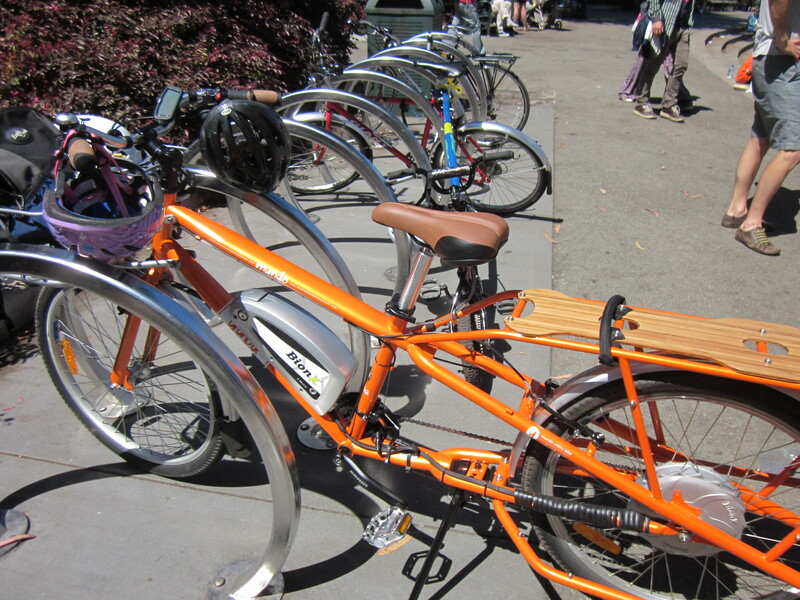 Poor kickstands are legion among longtail and midtail bikes. Putting live weight on a bike is different from putting dead weight on it, and having a decent kickstand is critical to being able to load the bike safely with two younger kids, or being able to add cargo to a bike with kids on it (and kids come with a lot of stuff). You can’t put the kickstand down without getting off the bike, but the bike is unlikely to topple while parked. The electric assist, which works using a twist-throttle on the right hand grip, is very simple to operate and powers smoothly up mild to moderate hills. The further you turn the throttle, the more power you get from the motor. I always overheated getting the Mundo up San Francisco hills, which was extremely undesirable given that I commute in work clothing. The elMundo is better. Both the Mundo and elMundo are relatively short for cargo bikes, at just shy of 7 feet, and that means that they are much less painful to park and store. Although the Mundo is wide in back, you’ll be able to fit it into a normal bike corral if you roll in forward. However you will still need walk-in parking, or close to walk-in parking, and there is no way you could carry the bike upstairs. The Mundo takes up a lot of room at the conventional San Francisco “bike rack”, which is a parking meter, but it won’t completely block the sidewalk as a Bakfiets or trike would. The elMundo (as well as the Mundo) can take an infant seat on the front, which makes it possible to carry three kids (two on the deck, one in front) with minimal squabbling. The elMundo can carry a lot of cargo in addition to kids. Yuba’s Go-Getter bags, which are Mundo-specific panniers on the rear rack, are gigantic and don’t sag because they are supported by the side beams on either side of the rear wheel. If you don’t like the Go-Getter bags, you can install Xtracycle FreeLoaders (this would be my choice). The optional front Bread Basket is frame-mounted. It takes some getting used to, because it doesn’t turn with the bike’s front wheel, but that frame mount means that it can carry a lot of weight. For example, friends with an elMundo bungeed a 16” kid bike with training wheels to it last weekend. We carried a week’s worth of shopping on a Bread Basket. The Mundo and elMundo have some nice design features. For example, the side beams that stick out on either side of the rear wheel can be used as footrests for riders on the deck or as a way to easily haul a second bike. The bike is accessible to riders of a range of heights with an adjustment of the quick-release seat. A front wheel stabilizer to keep the bike from toppling due to the weight of the front wheel is standard. The deck and optional foot boards are made from bamboo; very pretty. The color choices (orange and black) are more attractive than most. And if you don’t have much storage space, the Yuba can be balanced “standing up” on the back of the frame (photo here), assuming that you don’t have a child seat on the end of the deck. The eZee electric assist on the elMundo is underpowered. I had heard reports that it failed on steep hills, which I believe. It struggled on moderate hills, slowing substantially on the longer ones, even with no kids on deck or other cargo. (My definition of a moderate hill is roughly 10% grade, which is maybe atypical but is consistent with San Francisco topography. However note that the bike was unloaded.) Ultimately I climbed hills faster by turning on the assist for a while, then turning it off and pedaling for a bit, then turning it on again, etc. This worked but did not improve my mood. A BionX assist is much more efficient and did not struggle at all on comparable grades, even with a two-kids-and-all-their-gear load. However a BionX assist is substantially more expensive, and a BionX rear wheel is only rated to carry 220 pounds. Given that safe cargo weight limits on longtails can be exaggerated this might not make much practical difference. However several hundred dollars in price difference for a BionX assist is not trivial. The eZee battery is very wide, and that means that the elMundo has lost the Mundo’s front triple ring, because there is not room at the back for the chain to run freely with three front rings. The elMundo has only seven gears in the back instead of the 21 gears on the Mundo (3 in front x 7 in back). Converting a Mundo into a elMundo costs ~$2000 at San Francyclo, more than the $1400 price difference between the two bikes at purchase, in part because of the parts swap on the front ring. The eZee assist is a throttle assist rather than a pedal assist. (There are after-market eZee assists that have a pedal-assist option, and evidently at least one person has put one on a Mundo, but I’m focusing on the stock elMundo.) This is a personal preference, but I am much happier using a pedal assist, in part because the effort of pedaling is multiplied when riding instead of replaced. When I turned the throttle on I stopped pedaling, and this made riding the elMundo feel like switching between a bike and a moped. Front hub motors like the eZee are somewhat noisy. The sound of the motor, when it was on, negated some of the good acoustics I liked when riding the bike unassisted. The motor wasn’t nearly as obnoxious as after-market mid-drive motors—the one I tried was like a Vespa—but it was louder than manufacturer-installed mid-drive motors like the Panasonic, and I found even that mild rattle vaguely annoying when I tried it. The Mundo and elMundo both have cheap parts. What that means from a practical perspective is that they can be less than fun to ride at times. There is mild rattling while the bike is moving and I noticed bad pavement more than usual (and this bike was better maintained than the Mundo I rode earlier in the year). When I tried to shift gears, sometimes it worked and sometimes it didn’t. That probably wouldn’t matter much to me if I lived in Chicago, where people can ride for hours without changing gears, but I live in San Francisco, and I rarely ride for more than a few minutes without needing to shift. Having ridden bikes with better components, and discussed these issues with the shop, I feel confident that this is not my incompetence; instead, it’s that the stock gearing uses cheap parts. Similarly, the stock brakes on the elMundo are terrible. Not only is there a rim brake on the front wheel, the rear disc brake was weak and slow to stop the bike, even when it was unloaded (the Madsen has a similar setup, which I also disliked, but the brakes on the Madsen worked better; I have no idea why). Again, maybe a San Francisco-specific issue; I am paranoid about bicycle stopping power. The elMundo felt sluggish. This is difficult to explain, and I doubt that I would have noticed if I hadn’t spent a few weeks riding many other cargo bikes. However after that my conclusion was that some bikes like to go fast (Big Dummy, Bullitt), and some bikes want to go slowly (Bakfiets, elMundo, Mundo). I felt like I was constantly fighting the elMundo to get up to the speed I wanted to travel. When I rode the Mundo, I had issues with the side loader bars that stick out from either side of the rear wheel. In many ways these are very handy, because they provide nice footrests and support the Go-Getter bags. However for me their width was frustrating on city streets in narrow bike lanes. I was never sure whether I could thread through pinch points in traffic, particularly at intersections when cars move to the right curb and block half the lane. With Go-Getter bags the problem is exacerbated, as they’re so big that the width of the bike in the rear then becomes almost 36 inches, wider than most bicycle trailers. For this reason, I thought that the Mundo, when I rode it, was more of a suburban or small city bike than a big city bike. From a parental perspective, riding with the kids in back is less fun than riding with the kids in front, because you can’t really talk to them. Moreover you can’t easily break up fights. Technically there is room on the back deck for three kids (and the Mundo/elMundo can certainly handle the weight) but putting three kids in close proximity like that is like putting both of our kids on the deck of our Kona MinUte: sometimes we get lucky and they get along swimmingly on a long ride, and sometimes they start smashing helmets in less than a minute, at which point we have to walk the bike. With a longtail loading the bike is more complicated than it is with a box bike. Box bikes don’t have any issues with, say, a mega-pack of toilet paper. However if you ride a longtail there’s always going to be some repacking with bulky items. My daughter, who is three, can’t climb up to the deck and into the child seat unassisted. It is useful when kids can load themselves onto the bike, although this issue is less critical given that the elMundo has a good kickstand. Both the Mundo and elMundo are very difficult to walk while loaded and to start up an incline while loaded without tipping over. I dumped my kids on the Mundo, and given time, the same thing would happen with the elMundo. Although I often feared dumping my kids with the front box bikes, it never actually happened. Longtails are less stable than box bikes. The top tube on the Mundo and elMundo is fairly high. That’s part of the reason it can carry so much weight without complaint, and that’s no small thing, but I suspect that shorter riders would have trouble getting on and off the bike for this reason. It involved more contortion than I would have liked and I’m 5’7”. Update: Check out the comments below for a nice discussion of how a 5’2″ rider gets on and off the bike. Like most of the longtails, the elMundo comes without any of the commuting accessories that make bikes easier to ride in a lot of situations. Although fenders are standard, there is no chainguard, there are no dynamo lights, and neither one appears to be an option. Adding a child seat is $170, the Go-Getter bags are $130 each, the front Bread Basket is $130, stoker bars for an older kid are $60, and seat cushions for the deck are $30 per kid. Getting the bike to the point where it can carry two kids and a reasonable amount of cargo would cost a fair bit on top of the list price of the bike. And there is no rain cover for the kids. And I’d still have to tie up my pants. When I rode the Madsen, I realized pretty quickly that I wouldn’t be comfortable riding it in San Francisco without substantially upgrading the parts. And frankly that seemed like too much work given that there were other choices. The same is true for the elMundo. Yuba sells a frame kit, and it is possible to buy that and build it up with much higher-quality parts: better brakes, better gearing, better tires, probably dynamo lights, a stronger assist, and so forth. I suspect that would resolve many of my issues with the elMundo: it could stop quickly, could climb hills better, wouldn’t resist shifting gears, and probably wouldn’t be as sluggish. The question is how much that would cost. Some parents at our son’s school recently bought a customized Mundo with excellent parts that had been returned to the shop by another customer. The shop (Roaring Mouse) had also installed a BionX assist. It is a beautiful bike and they have zero problems climbing San Francisco hills—I saw the mom at Sunday Streets last weekend pedaling casually up to Alamo Square—but they said that their bike was quite expensive even though the price had been significantly reduced because it was a customer return. I suspect that a Yuba Mundo/elMundo upgraded to the point that I’d enjoy riding it would cost at least as much as a Surly Big Dummy. At which point I have to ask: why not buy a Big Dummy? It would be a lot easier. And yet. I am picky about these issues because I live and work on steep hills in what I am told is the second hilliest city in the world (and this is not a competition you want to win). My situation is not typical, perhaps not even in San Francisco. I see a LOT of Mundos and increasingly, elMundos, in the city now, primarily in the Richmond and the Sunset. Families who live in these areas and commute to local schools and/or along the Wiggle have no need for a bike that can scale steep hills. There are few serious grades in those parts of the city, the streets are wide and mostly empty of moving cars, and they can rent a car if they want to go to the Randall Museum. I would be surprised if families who live on Nob Hill or Potrero Hill could make an elMundo work for them without serious after-market modifications, but there are lots of families who don’t need to go those places. The elMundo is cheap and its parts are sufficient for most riders. This bike makes it easy to take up commuting by bike with kids, and in flat cities, the same is true of the Mundo. There are no complicated decisions to make, riding it is painless, the bike is inexpensive, and it will get most people where they need to go smoothly. This is why I think the elMundo will be a category-killer. Thanks for another excellent review! Your passing reference to “midtail bikes” made me scratch my head and wonder if there really is more than one (i.e., the MinUte). As a one-kid family with six steps down to our bike parking, we’re surely destined to get a midtail sooner or later. Then I found the about-to-be-released Kinn – wow! a steel midtail! – and the Yuba Boda Boda, too. I’d love to hear your take on them. How can we convince Kinn to send a bike to SF?? I would love to trying riding both bikes! I knew they were coming but the Boda Boda just shipped earlier this week and Kinns are still pre-order. There is evidently a Kinn for test rides in Portland that @1lessgmsuburban on twitter has ridden. And @kristimarleau on twitter has tried both the Boda Boda and our MinUte and she could give you her impressions. She and her husband are the only people I know who’ve actually ridden TWO midtails. You’re welcome to take a ride on our MinUte too. Honestly I think that both the Boda Boda and the Kinn are nicer-looking bikes. However the MinUte has mountain-bike gearing, which is very helpful on hills. To make things even more confusing, all the bikes come with various different extras: MinUte has bags and fenders, Boda Boda has a chain guard and integrated assist option, Kinn has a lockbox and the cool swivel-seat and built-in adjustable foot-pegs, plus rumors of a far better kickstand, and so on. Stepping in to comment as an Official Short Person and Yuba Mundo rider. I’m 5’2″ with a 26.5″ inseam, so I have to give a lot of consideration to standover height when I’m riding bikes. For me, the Mundo’s top tube is just low enough that I can comfortably straddle it. I can’t “step through” it, but the cockpit is long enough that I can lean forward and do a back-leg-lift over the top tube without worrying about kicking my rear-seat-riding son in the face. When he was riding in a front-mounted iBert, I swung my leg over the rear seat and part of the rear rack in a more traditional mount/dismount; there wasn’t room between the iBert and the bike seat for me to “step off” the seat at long stops like I can now, which is something I find more convenient about having him in a rear seat these days. The real struggle was when I had a front-mounted seat AND something on the rear rack, as in those few weeks when I had both front and rear mounted seats installed to give my son his choice of where to ride. There was no room to lean forward and do my modified step-through; nor could I swing my leg back without kicking my son in the face. I believe Ella Bustamante of Tiny Helmets, Big Bikes is similarly petite and she was rocking the front-seat back-seat combo on her Mundo for a while. Either she has really great balance, or she knows some mounting/dismounting trick I’m not aware of! One more thing about that high top tube: it means that I can’t roll the bike off the kickstand while straddling it. The bike has to lift several inches to roll off the kickstand and there’s no clearance for it to do so because I’m so short. It would be really nice not to have to balance a full-loaded longtail while I’m mounting and dismounting. Someday I may invest in a Rolling Jackass centerstand, but that upgrade is far down the road. Thanks for this information! I have heard how hard it is for shorter riders to find cargo bikes, so it’s very useful to know that the Mundo is a possibility. I can totally understand why you want a Rolling Jackass, too. I have this recollection that Elle is taller, though, because she said she wanted to try riding a Bullitt sometime, and that wouldn’t be possible if she were 5’2″. Just noticed my name in the conversation 🙂 a little late… I’m 5’6″, longish legs. The Mundo fits me well. The front seat was a squeeze but doable. My husband had a hard time fitting in between the seat and baby. I love this bike though! Thanks for this awesome review. We’re in Seattle and have the hills too. two questions: did you test ride the 500 watt motor? i understand they recently upgraded. and im curious if you have a favorite e-assisted cargo ride? we love our xtracycle but dropping off kids and dealing with hills and fishtailing is getting old. Would love your advice. Yes, I rode the elMundo with the 500 watt motor. My favorite e-assisted cargo ride sort of depends on circumstances. I love our Bullitt for hauling two kids at once. If you want a front-loading box bike that can handle hills I think it’s untouchable. But I still like to take the mamachari on short trips with one kid that will involve a lot of maneuvering in tight spaces. If I were looking for a longtail bike, my first choice would probably be the Xtracycle Edgerunner (but with a BionX assist rather than the eZee assist they’ve put on their demo model), which I just test-rode last weekend. If I were looking for a midtail, the Yuba Boda Boda is under-geared for the hill that we live on but for almost anywhere else, it’s an unbeatable value. Overall I think that the new bikes from both Xtracycle and Yuba are really serious improvements on what was on the market even just a few months ago. I hope that helps! Wow, this is fantastic! This answers so many questions that I had. Given that our town in Iowa is relativey flat, the Mundo still seems like it could be a good choice for us. And price is an issue, so I’m not snubbing the Ikea version of a cargo bike 🙂 But your review has also made me wonder about a bucket bike after all. Unfortunately, we don’t have a lot of options around here to test ride, but I’ll just have to find some. Thanks again for such a thorough report, this is extremely helpful! I am a car-free person and have a couple of things that are important to me as I will ride this all the time, even in the winter. I want to build the bike myself and Yuba allows you to buy the frame only. First… is that I will want electric assist as hauling a lot of weight up a hill is not even possible without it. I don’t like the Bionx as I hate derailleurs, (not reliable enough) so I am going to do a internally geared hub, more specifically either a Alfine or Rohloff. The electric system I am interested in is the one offered by the Urban Commuter Store, which is a mid-drive unit which I feel is more reliable. They make one that mounts directly to the Mundo and allows you to use all the gears under power. Check it out. I think buying a cargo bike without electric is not a good idea, as even riding against a strong wind will be very tough. Second…is frame flex. I have a friend that has a Big Dummy and under a load the bike bounces as the frame flexes from the weight. If I get one I want to use it for camping, (that is also why I want electric) so I will be riding on the highway and going downhill on a bike that flexes is a hair-raising experience. So can you tell me just how stiff the Mundo frame is? Have you noticed a lot of flex going downhill under load. Sorry to not to see this sooner. The Mundo does not flex. It is a tank. I looked at the top/popular cargo bikes in the market and found nothing could come close to the Yuba Mundo for price vs. features vs. quality of the build. We paid $900 for a leftover 2013 V4 model and have upgraded the brakes to Tektro disc and added BionX’s top of the line SL-350-DX system. The BionX alone cost twice as much as the Mundo LOL but we are still “only” into this project $3100 which is cheap for a electric cargo bike of any quality. I think with the BionX and brake upgrade, the bike do what we want it to do. Equipped with the Tektro-E710 hydraulic brakes the Mundo now stops very well, even with a couple hundred pounds on the back. The BionX seems to have enough power to climb the hills around here with some pedal assist and we have some pretty good hills around here. I haven’t upgraded the gearing yet as it seems to function well enough. Will probably do that if/when it starts to give me any trouble. My Mundo as equipped is right at the 70lb mark. When shopping for a Cargo bike I found that you can upgrade a Mundo with some better components and deck it out with the accessories you need and still be way under a similarly equipped Big Dummy or XtraCycle. I suspect that’s the primarily reason why the Mundo’s been selling so well. Also Yuba’s accessories catalog has grown to provide lots of accessories that allows you to custom tailor the Mundo to your exact needs. They are catching up with all the XtraCycle accessories available. If money was no object I would probably have gotten the Surly Big Dummy and decked it out. My friend has a nicely upgraded BD and he only laughs when you ask him how much he has into it. Tons I’m sure. The base BD price along with the same BionX system I have on the Yuba, your probably talking four grand. 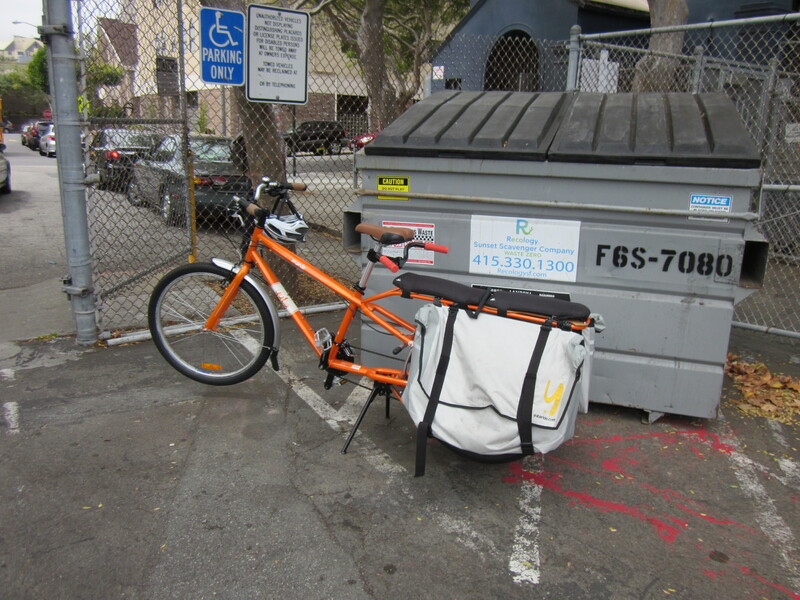 Another good cargo bike that I think everyone overlooks is the Trek Transport. I could have picked up one of those new for $1000 and put a BionX on it for the same price. Great reviews by the way. Learned allot from Humofthecity before we made our purchase.